Vaccinating non-humans is not a novel idea. Domesticated dogs and cats have been inoculatedagainst rabies, Lyme disease, and even the flu for many years. However, using them to protect insects has never been considered possible. That’s because vaccinations entail injecting a dead, or weakened, version of the virus into the body and allowing the immune system to create antibodies to fend off the disease. Since insects do not possess antibodies, they lack a "memory" for fighting infections and therefore do not benefit from traditional vaccinations. Dalial Freitak, a biologist at the University of Helsinki, came up with the idea of an edible insect vaccine in 2014, after observing that when a moth was fed certain bacteria, it was able to pass on immunity to its offspring. 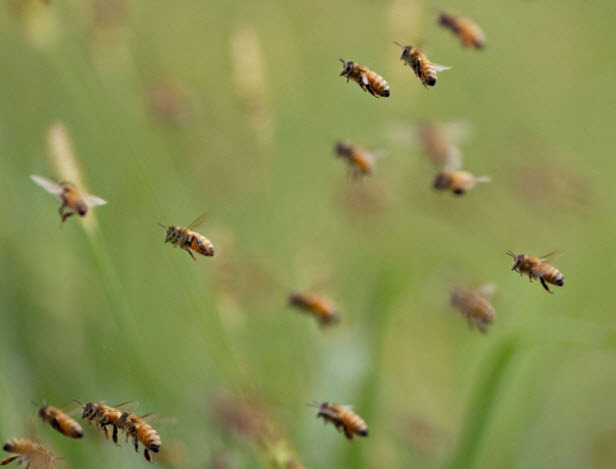 Meanwhile, her colleague, Heli Salmela, had noticed that vitellogenin, a bee protein, appeared to have a similar effect to invasive bacteria in bees. "So they could actually convey something by eating. I just didn't know what the mechanism was. At the time, as I started my post-doc work in Helsinki, I met with Heli Salmela, who was working on honeybees and a protein called vitellogenin. I heard her talk, and I was like: OK, I could make a bet that it is your protein that takes my signal from one generation to another. We started to collaborate, got funding from the Academy of Finland, and that was actually the beginning of PrimeBEE," Freitak explains. The first PrimeBEE vaccine, which is still undergoing safety tests, aims to protect honeybees against American foulbrood, or AFB, an infectious disease which affects bee colonies worldwide. The harmful bacteria, introduced to the hive by nurse bees, feed on larvae and generate spores which spread and infect the entire hive. 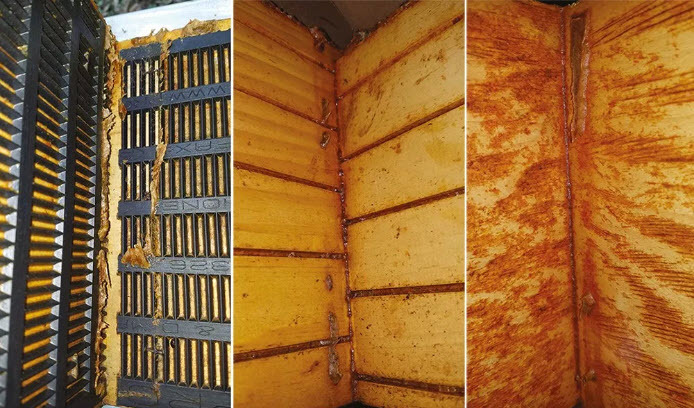 “It's a death sentence for a hive or colony to be diagnosed with the disease,” says Toni Burnham, president of the D.C. Beekeepers Alliance in Washington. The researchers, who unveiled their findings on October 18, 2018, say the vaccine teaches honeybees to identify harmful diseases, similar to how antibodies function in humans and animals. They explain, "When the queen bee eats something with pathogens in it, the pathogen signature molecules are bound by vitellogenin. Vitellogenin then carries these signature molecules into the queen's eggs, where they work as inducers for future immune responses." The researchers believe that once the first PrimeBEE vaccine is perfected, defense against other pathogens will be easy to create. 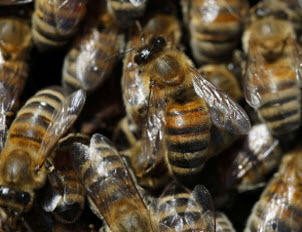 Among the social insects, bees have developed a strong and rich social network, where busy worker bees tend to the queen, who in turn, controls reproduction for the benefit of the hive. But the South African Cape honey bee (Apis mellifera capensis) can flout these rules. In a process of genetic trickery called thelytoky syndrome, worker bee females ignore the queen's orders and begin to reproduce on their own. Scientists, in their own altruistic effort to protect the Cape honey bees from a recent devastating blight, transferred the Cape honey bees to a northeastern region—-only to see the Cape bees wreak havoc among colonies of the neighboring honey bee subspecies A. m. scutellata. The A. capensis bees turned from altruistic workers to the guests who would not leave—-becoming social parasites that forage on their own into foreign colonies, reproducing an army of loyal workers, stealing all the honey, and eventually, dethroning the queen and taking over the host colony. This type of behavior, despite making for bad neighbors, makes a lot of evolutionary sense. If the queen is lost, then the thelytoky syndrome at one point must have first kicked in as a life raft to save the colony. But if this is the case, why hasn't it become a more widespread phenomenon for other bee species? Recently, scientists have combed through bee genomes to narrow down the genetics behind thelytoky, and linked these to candidate genes in the past few years—-but to date, the master genetic switch has not been found. Now, for the first time, a group led by Denise Aumer and Eckart Stolle, working in the lab of Robin Moritz at the Martin-Luther-Universität Halle-Wittenberg's Institute of Biology, have finally found the root cause responsible for thelytoky. The findings were published in the advanced online edition of Molecular Biology and Evolution. "Uncovering the genetic architecture underlying thelytoky is a big step towards understanding this mode of reproduction, not only in the Cape honeybee, but also in other insect species in general (e.g. many invasive ants reproduce in a very similar fashion)," said Stolle. "After having worked on the topic for so many years with so much efforts by our colleagues and us to add pieces to the puzzle and also with the one or other dead end, it is a huge accomplishment for us to have come to this point." By comparing the genomes of Cape honeybees which produce diploid female offspring (thelytoky) with those producing haploid male offspring (arrhenotoky, i.e. the expected mode of reproduction), they identified a candidate gene located on chromosome one, LOC409096, and proposed to call it Thelytoky (Th), as the major regulator of the selfish worker bee reproduction. Thelytoky encodes a receptor protein with a transmembrane helix and a signal peptide at the extracellular N-terminus, indicating that it is linked to a secretory pathway. A. m. capensis pseudoqueen (bee with white tag on thorax) eliciting retinue behavior in the surrounding A. m. scutellata host bees. Credit: Picture taken by Mike Allsopp. Specifically, a single mutational substitution in exon 7 of Thelytoky causes a change from the polar amino acid threonine to the non-polar amino acid isoleucine in the protein sequence, leading to substantial structural modifications and likely functional consequences. In addition, they confirmed their genetic data by showing that RNA levels of Thelytoky were elevated only in the selfish bees. They also performed DNA sequencing of another honey bee population and found the same exact mutation amongst the socially parasitic lineage of the Cape honey bee, but not among workers of other honey bee subspecies. From the study of the genetics, they determined that Cape bee selfishness exhibits a dominant inheritance pattern, which means that only one mutation that needs to be passed down to perform the selfish genetic switch. But the genetics are a bit more complicated because it turns out that the selfish gene still needs its altruistic partner (known as the social, or arrhenotoky form of the gene). "The genetic control of the thelytoky syndrome is regulated by a more complex genetic mechanism than previously assumed," said Aumer. "The thelytoky allele (Th) is not recessive, i.e., needing two copies of the mutated gene, but rather a dominant allele. This dominant mutation expresses the phenotype (thelytoky) when one copy of the gene is the mutated variant, and the other copy is the one variant typical for the Cape honey bee." "But at the same time, it appears that having two copies of the mutated variant is detrimental, perhaps even lethal, while having two copies of the "regular" Cape bee variant of this genes makes them reproduce normally. Any other combination of the mutated variant with another subspecies' variant would be non-matching alleles and would result in either non-functional or fertile normally reproducing (arrhenotokous) phenotypes. 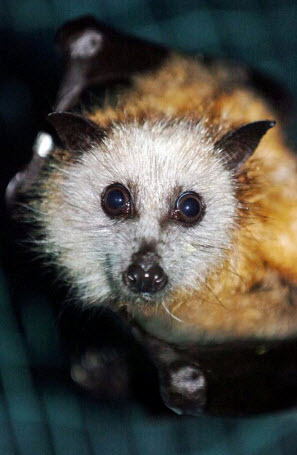 Therefore, the Cape bee typical Th variant seems to complement the mutated Th variant in a way that the offspring is fertile and expresses the unique set of phenotypes referred to as thelytoky syndrome." Because only one gene can get passed on during reproduction, the genetics not only explain why breeders, for the past 150 years, have been mostly unsuccessful with producing thelytokous workers from mating the Cape bees with others, but also why the thelytoky behavior hasn't spread into other bee populations. Genetically, it turns out you still need a little altruism to be truly selfish. When only one is passed on from interbreeding, the effect is lost without its partner gene. "On a broader level, the identified genetic architecture of thelytoky in honey bees may serve as a model for other eusocial species with similar thelytokous reproduction, in particular for novel ant model systems, such as Platythyrea punctata and the clonal raider ant Ooceraea biroi," wrote the authors in the Molecular Biology and Evolution publication. And just like the striking case of malaria and hemoglobin genes in humans, the study shows how just a single change in the DNA can have such a dramatic effect on a species, or in this case, changing the behavior of a bee from a helper to a mercenary. 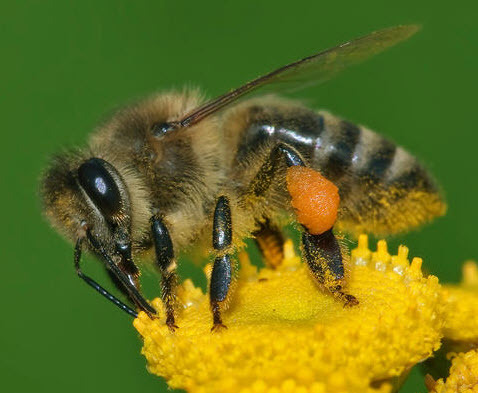 APIS, short for "antifungal porphyrin-based intervention system," uses genetically engineered E. coli bacteria to produce molecules called porphyrins that damage the spores of Nosema ceranae, the most widespread fungus infecting honeybees around the world. 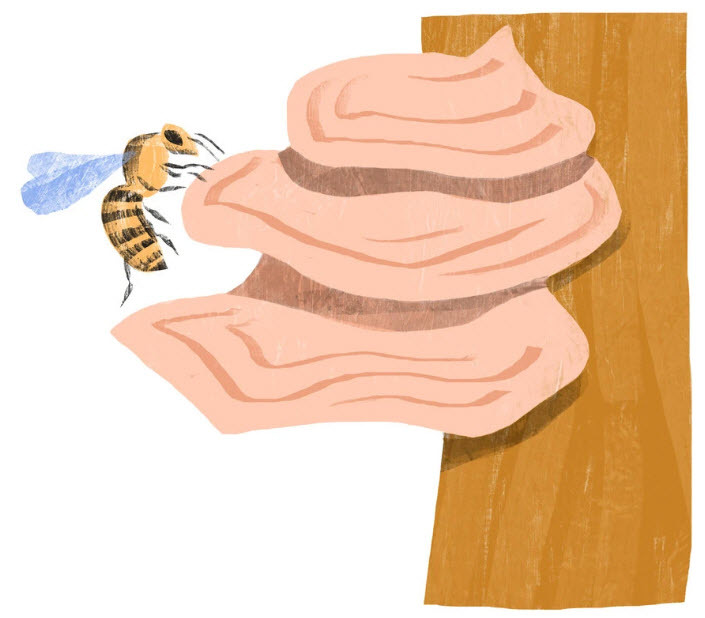 Beekeepers can feed the product to their hives to help eliminate the fungus in the bees' digestive systems. The students created the product as a project for the 2018 International Genetically Engineered Machine (iGEM) Competition that took place in Boston last October, where they won first prize and a gold medal in the food and nutrition category. A month after the competition, the team presented their research at the annual conference of the Alberta Beekeeping Commission. "It allowed us to expose our work to commercial beekeepers and to bee researchers who might be able to pursue further development," said science student and team member Julia Heaton. "We've had interest in our project from some of these beekeepers, as well as from beekeepers who saw our research in the media. "We have commercial beekeepers who are willing to conduct the necessary field trials to allow commercialization of our project. We've also looked into patenting our system with the help of TEC Edmonton." Honeybees in cold climates are even more vulnerable to the fungus that infects their digestive systems—a problem of particular concern in Alberta, which produced more than 40 per cent of Canada's honey in 2016, worth more than $60 million. The only existing treatment for Nosema ceranae is a fungicide called fumagillin, but it has been discontinued, making the problem even more critical. "Bees have been a really hot topic lately, but although a lot of people know that bees are in trouble, not a lot of people understand why," said Heaton. "We also wanted to raise awareness of a problem that deeply affects our province and our communities, but not many people know about," added Anna Kim, a team member studying biology and psychology. Under the supervision of mentors, more than 300 university teams are tasked with using genetic components to create biological solutions to real-world problems. "Very often in science, we first find 'solutions' and then we go looking for a problem," said U of A chemistry professor Robert Campbell, who mentored the student team for the competition in which more than 300 university teams are tasked with using genetic components to create biological solutions to real-world problems. "It is so important to identify a problem first and then find the best solution, no matter where that leads you. This team identified the problem of Nosema infections in honeybees and was inspired to conceive of an original, feasible and practical solution." The reddish-brown varroa mite, a parasite of honeybees and accidentally introduced in the Big Island of Hawaii in 2007-08, is about the size of a pinhead. Yet, its effects there are concerning to entomologists because the mite is found nearly everywhere honeybees are present. A team led by entomologists at the University of California, Riverside, performed a study on the Big Island and found viruses associated with the mite have spilled over into the western yellowjacket, a honeybee predator and honey raider. The result is a hidden, yet remarkable, change in the genetic diversity of viruses associated with the larger pathogen community of the mite and wasp, with repercussions yet to be understood. In particular, the researchers saw a loss in the diversity of deformed wing virus, or DWV, variants, resulting in new strains whose impact is hard to predict. DWV, widespread in honeybee populations globally and made up of several variants, is thought to be partly responsible for global die-off of honeybee colonies. DWV infects bumblebees and has been detected in other insects. The yellowjacket wasps can acquire this virus directly or indirectly from honeybees. 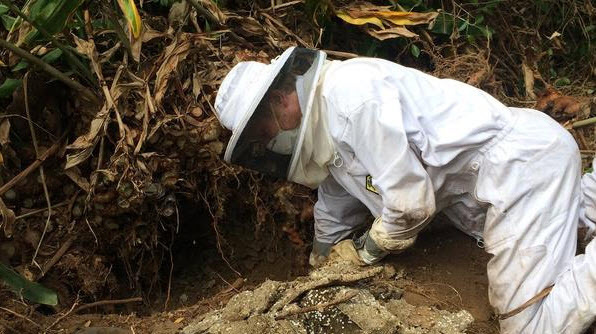 By a stroke of luck, the researchers had the benefit of studying the honeybee and yellowjacket populations on the Big Island both before and after the varroa mite was introduced there. They saw more association of honeybees with pathogens after the appearance of the mite. Indeed, some pathogens were detected in the honeybee and wasp populations only after the mite was introduced to the island. Wilson Rankin noted the pathogens are often incorrectly called “bee pathogens” because they were first found in bees. The pathogens, however, are found in a wide variety of insects. 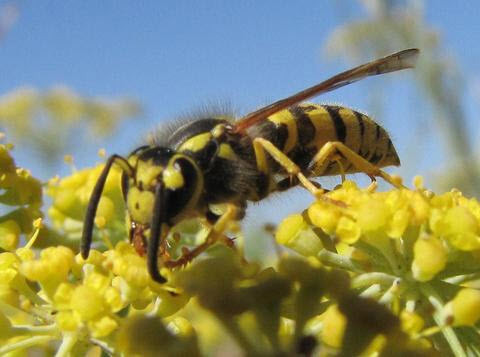 The western yellowjacket is a honey bee predator and honey-raider. The researchers sampled 25-45 bees and wasps for one part of the study, and then about 100 individuals, analyzed in groups, for each of the species during the period before and after the mite was introduced to the Big Island. The researchers did not study native bees, focusing instead on honeybees and yellowjacket wasps, neither of which is native to Hawaii. “Our findings suggest that pathogen transmission from domesticated bees, such as honeybees, may be important even for non-bee insects like the wasps we studied,” said Kevin J. Loope, the research paper’s first author, who worked as a postdoctoral scholar in the Wilson Rankin lab during the study. “The impacts may be more subtle than previously observed: we found changes in the genetic variation of viruses found in the wasps, but not changes in the amount of virus. These findings suggest we should look more broadly and in greater detail to figure out how moving domesticated bees for agriculture may influence wild populations of insects. Loope, now a research assistant professor in the Department of Biology at Georgia Southern University, explained that finding overlap in the pathogens of yellowjacket wasps and domesticated bees also means that using pathogens to control undesirable wasp populations is risky. “Any biological control efforts using pathogens should be carefully evaluated to prevent inadvertent harm to beneficial bees,” he said. He added that the research team was surprised to find a dramatic difference in the viral genetic diversity between the wasp samples from the two periods — before and after the varroa mite was detected on the Big Island. Wilson Rankin and Loope were joined in the research by Philip J. Lester of Victoria University of Wellington, New Zealand; and James W. Baty of Malaghan Institute of Medical Research, New Zealand. 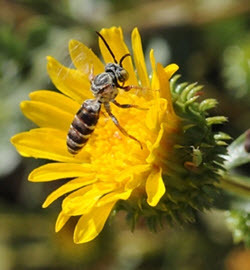 Genetic analyses on the bee and wasp samples were performed at UCR and in New Zealand. Wilson Rankin was supported by grants from the National Science Foundation and the Hellman Fellows Fund. Loope was supported by a postdoctoral fellowship from the National Institute of Food and Agriculture of the U.S. Department of Agriculture. Our first LACBA meeting of the new year will be held Monday, January 7, 2019. 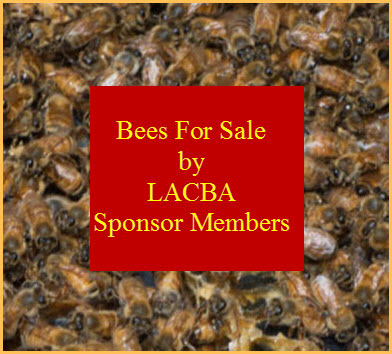 Meetings of the Los Angeles County Beekeepers Association are open to the public. All Are Welcome! Learn about LACBA committees and how you can participate. Beginning with the Committee Meeting, we will be discussing our upcoming Beekeeping Class 101: Class size, instructors, class fee, etc. BRING YOUR IDEAS! An experienced beekeeper will share on how they got into beekeeping and what went on in their first two years of beekeeping. Specifically focusing on mistakes made, the trials, tribulations, problems. 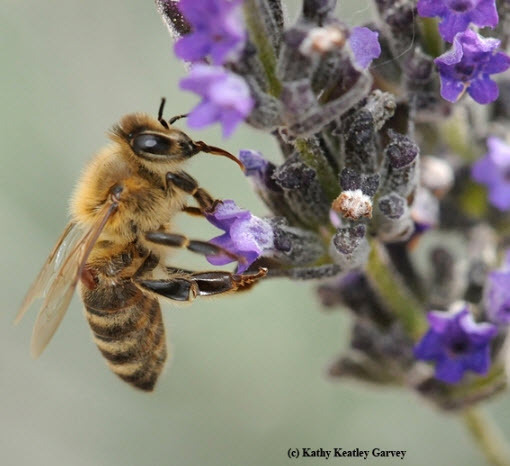 Bill Lewis will present an informative tribute to photojournalist and bee photographer, Kodua Galieti, utilizing her extraordinary photographs to show what goes on inside a beehive and the various stages of honey bee development. Long time beekeepers and new-bees are sure to find the presentation fascinating. We’re hoping all those who attended the CSBA Convention will share a short report on what you found most interesting, informative, entertaining - something you can share with the rest of us. Thank you! Presentation of the 2018 Golden Hive Tool Award. What Do You See Going On Inside and Outside Your Hive This Time Of Year??? Next month Wildflower Meadows to speak. RAFFLE!!!! Bring something for the Raffle! Discussion about changes for 2019 Beekeeping 101 Classes. 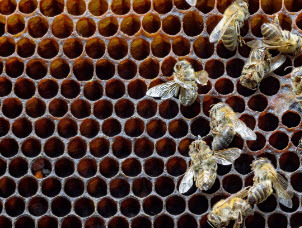 Your board of directors would like your suggestions as to changes to the 2019 Beekeeping 101 classes. Come to the Committee Meeting @ 6:30pm on Monday January 7, 2018 to give your opinion. This is your chance to participate in the discussion about the 2019 Beekeeping 101 classes. "The idea that honey bee nutrition influences colony level metrics of reproduction has been demonstrated before, but here, we examined an old story using new tools," Fine said. 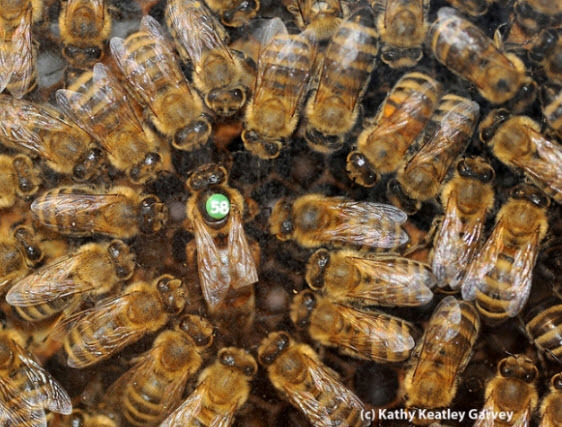 "We were able to get a clearer picture of how nutrition can affect the relationship between honey bee workers and queens and how this can impact the queen's egg production." "Egg laying occurs in the darkness of a hive occupied by thousands of workers and is therefore hard to track," Shpigler said. "Queen egg laying was never studied outside of the colony; the biggest challenge was to give the queens the right conditions for continuous egg laying outside of natural conditions." To move queen productivity successfully into the lab, the researchers focused on the essentials of their natural environment. 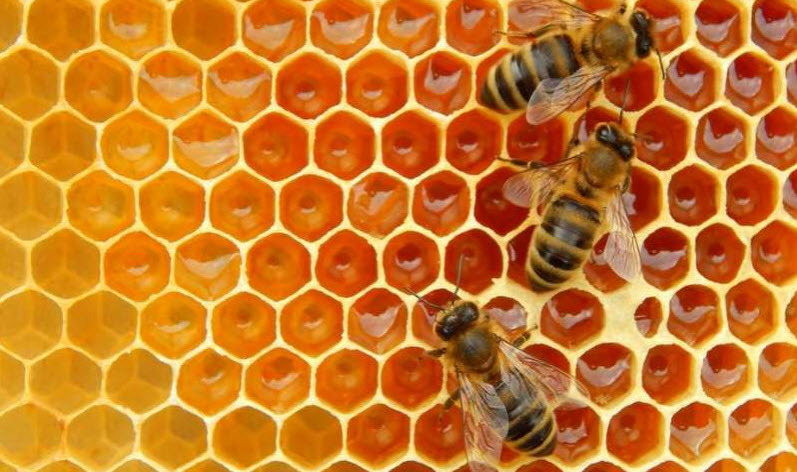 They developed a 3-D-printed plastic honey comb that they refined to mimic what a queen would experience in the hive, which ensured that the cage environment could be carefully controlled and kept pesticide free. 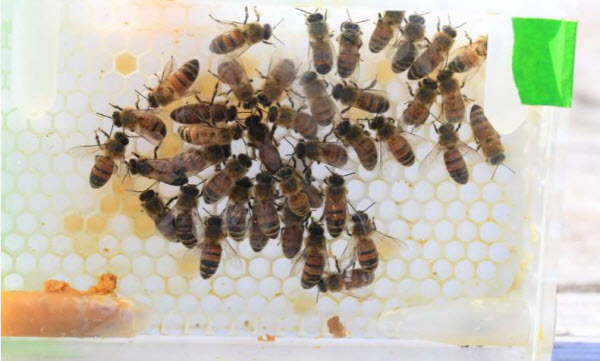 They also provided each queen with a small group of worker bees to feed and support the queen; this element became the inspiration for their first experiments with the new system. "Honey bee queens only ingest food in the form of glandular secretions provided to them by their worker caretakers, and queens are not known to lay eggs without the support of their worker bees," Fine said. "The more we worked in this system, the more it became apparent that the easiest way to influence the queen was to first influence the worker bees that care for her. Once we identified this strategy, designing effective experiments became easier." "The effect of the nutrition . . . was our first successful use of the system, giving us hope for more success in the future," Shpigler said. "The results show very nicely how the honey bee colony functions as one body, with shared digestive and reproductive systems. The workers are the ones that eat the food and the effect is on the queen egg laying—the superorganism in action!" "It's been exciting to see the kind of quantitative data that we can generate with this system using fewer resources relative to studies that use full size honey bee colonies," Fine said. "Eventually, we hope that this system can be adapted as a risk assessment tool to identify other factors that positively and negatively influence honey bee reproduction . . . there is an immediate need for a laboratory system that can be used to quantitatively assess risks to honey bee queen health and reproduction." 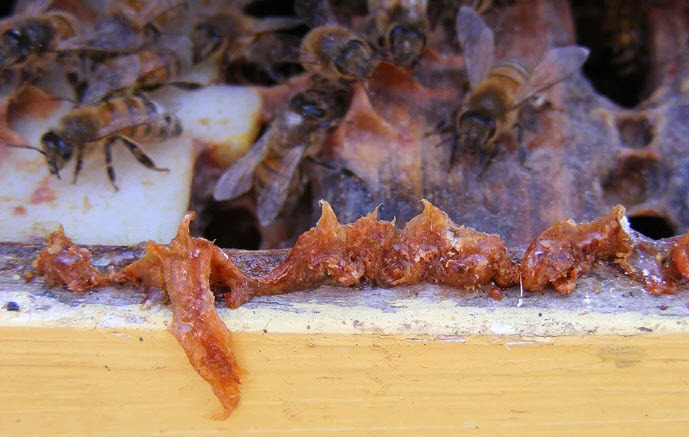 Propolis has also been connected to benefiting honey bee (Apis mellifera) immune systems, saving energy that would otherwise have been used to protect against nest-invading beetles like Aethina tumidaor parasites like the Varroa destructor mite, Nosema fungus, and viruses. In the past, some beekeepers have tried to keep their hives “clean” of propolis, believing it impeded with honey-making activities. Today, though, scientists and beekeepers have begun looking at encouraging propolis production to help sustain healthy hives. Honey For Your New Years Celebration. 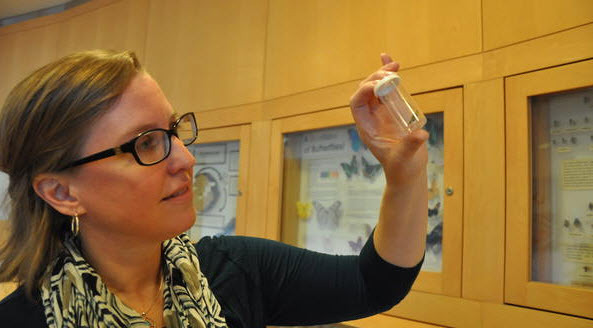 Michigan State University scholar Andrea Glassmire and her colleagues have revealed how the mixture of chemical weapons deployed by plants keeps marauding insects off base better than a one-note defense. This insight goes beyond the ecological convention of studying a single chemical compound a plant is packing and offers new ways to approach agricultural pest management. The research was published in the latest Ecology Letters. Glassmire, a post-doctoral scholar in MSU’s Department of Entomology and colleagues from the University of Nevada, Reno, found important relationships between plant defensive chemistry in the neotropical shrub, Piper kelleyi, and its associated insect pests. Since plants cannot move, they defend against pests that eat them using a bouquet of chemical compounds. Ecology, however, has been biased towards studying effects of single compounds even though a feeding insect would encounter a blend of plant compounds. It turns out that the type of defense bouquet matters, whether bouquets have the same compounds or a blend of different compounds. “If we can figure out the specific type of defense bouquet that is most effective at reducing insect feeding, then we can extrapolate these findings to agricultural systems to cut down on pesticide use,” said Glassmire. 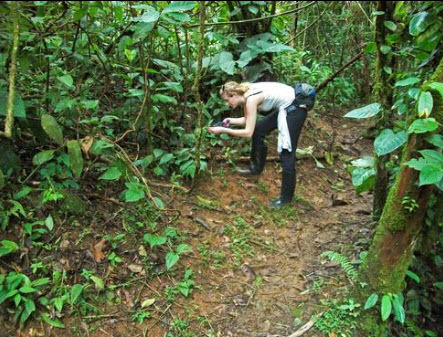 Glassmire and colleagues manipulated plant chemical defenses in the Andes Mountains of Ecuador using a field experiment where plants were hung at different heights in the forest understory, exposing them to a range of light levels. Their results suggest P. kelleyi plants consisting of defense bouquets having more kinds of defensive chemicals were more effective at reducing insect damage compared to defense bouquets having one kind of defensive chemical. The composition of defensive chemicals was dependent on the amount of light available. Subtle differences in light in the shaded forest understory induced changes in the defense bouquet. Remarkably, lower amounts of light increased the defense effectiveness of plants compared to higher amounts of light. Consequently, insect damage was reduced by up to 37% when P. kelleyi plants had bouquets of a blend of different compounds. Insects had difficulty consuming plants with different compound blends compared to plants with similar compound blends. Understanding how plants’ chemical defenses vary across the geographic landscape could have important implications for agriculture. Glassmire and colleagues’ results suggest that feeding insects have difficulty adjusting to neighboring plants that are chemically different and that reduces damage. Agricultural systems comprised of a single crop monoculture lack differences in their defense bouquet because they are all the same. The paper was co-authored by Casey Philbin, Lora Richards, Christopher Jeffrey and Lee Dyer of the University of Nevada, Reno, along with MSU’s Joshua Snook. The work was funded by the National Science Foundation, Earthwatch Institute, and a generous donation by the Hitchcock Fund for Chemical Ecology Research. Sometime in the 1980s, microscopic mites that had been afflicting honeybees outside the United States found their way to Florida and Wisconsin and began wreaking havoc across the country. These parasites have invaded and decimated wild and domestic bee colonies. Along with other dangers facing bees, like pesticides and the loss of forage lands, the viruses these mites carry threaten the bees we rely on to pollinate many of the fruits, nuts and vegetables we eat. Our research shows that extracts from the living mycelial tissue of common wood conk mushrooms known to have antiviral properties significantly reduced these viruses in honeybee colonies, in one field test by 45,000 times, compared to control colonies. In the field tests, we used extracts from two species of wood conks, the red reishi and the amadou. The famous “Iceman” found in a glacier in 1991 in the Alps carried amadouin a pouch 5,300 years ago. The red reishi has long been used as an immune-boosting tonic in Asia. Our hypothesis — and that's all it is, we don't understand the mechanism behind the results — is that extracts of wood conk mushrooms strengthen immunity to viruses. More study is needed. At present, there have been no substances proved to reduce viruses in bees. In the field study, a small amount of one of these mycelial extracts was added to the sugar water commonly fed to honeybees by beekeepers; wild bees could benefit too. I’m excited by the prospect of this research. I am a mycologist by trade — a mushroom expert — and I hope to create, with some colleagues, a nonprofit organization that could make available this mushroom extract and a bee feeder, similar to a hummingbird feeder, so that all of us can help save bees from our own backyards. Our team is designing a bee feeder that we hope makes it possible to track bee visits and their pollen loads. Ideally, citizen scientists will upload their data to a portal to monitor progress. I estimate that millions of these feeders are needed to reverse the decline in bee populations. Nature can repair itself with a little help from mycologists. Fungi outnumber plants by about 6 to 1; there are two million to four million fungal species, though only about 140,000 have been named so far. Our research underlines the need to save biodiversity for the discoveries to come. These mycelial extracts might aid other species like pigs, birds and other animals. But we need more animal clinical studies to prove that this will work on a wider scale. Mycology is an underfunded, understudied field with astonishing potential to save lives: ours and the bees. It's Time to Revisit the 13 Days of Christmas! 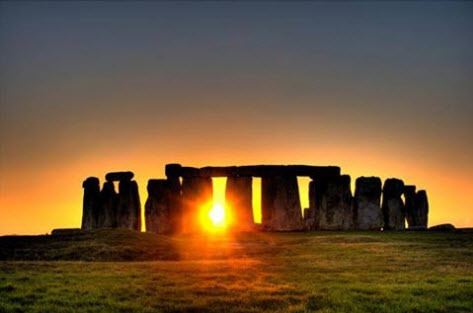 The Winter Solstice has been observed as an important date in beekeeping for over 2000 years. Read more to find out what the ancients have to say about winter and bees. "In healthy swarms the progeny of the bees only cease from reproduction for about forty days after the winter solstice." "From the winter solstice to the rising of Arcturus the bees are buried in sleep for sixty days, and live without any nourishment. 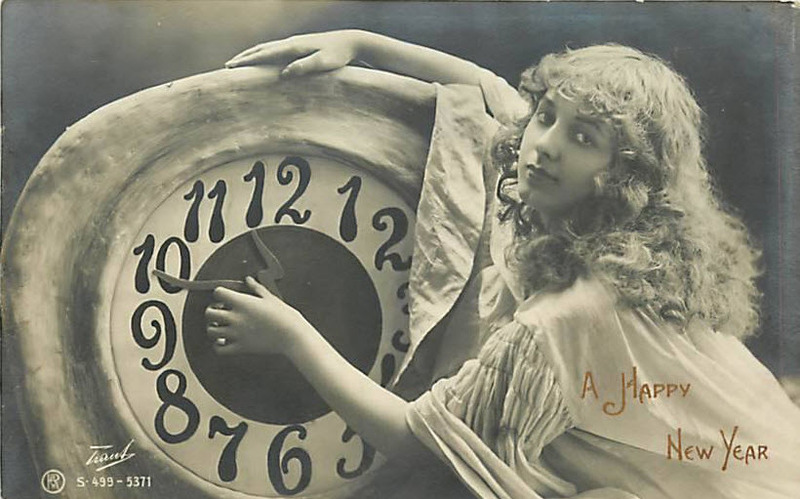 Between the rising of Arcturus and the vernal equinox, they awake in the warmer climates, but even then they still keep within the hives, and have recourse to the provisions kept in reserve for this period." "With cold benumbed, inactive they remain." "The ancients mention a very extraordinary method of preserving the bees in their hives, which was by filling up a considerable part of the vacancy of every hive with the bodies of small birds, which had been killed, gutted, and dried for that purpose. This was certainly a way of keeping out some of the cold air, but it is so odd an one, that, probably, no-body since that time has tried it." Worldwide honeybee populations are in peril – and it's a dire situation for humans. Threats from climate change, toxic pesticides, and disease have all contributed to a steep honeybee population decline since 2006. And as a third of the food we eat is a direct result of insect pollination – including by honeybees – there could be serious consequences for us if the species goes extinct. 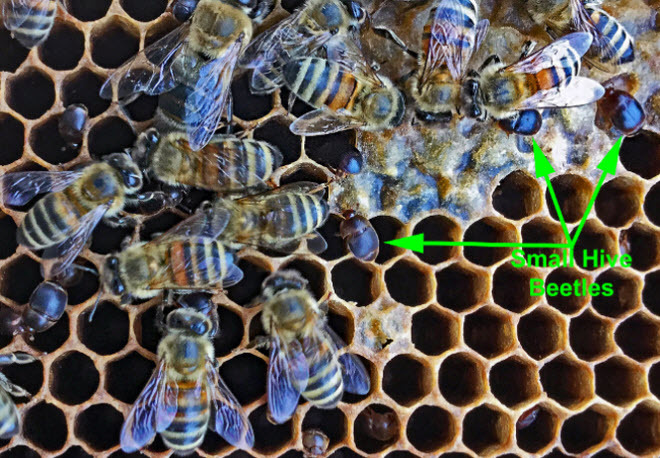 We recently uncovered more about a well-known, important honeybee signal known as the dorso-ventral abdominal vibration (DVAV) signal. Known as the honeybee "wake-up call," this signal tells other bees to prepare for an increase in work load, particularly in relation to foraging. We developed a remote sensor which allowed us to monitor honeybee colonies without opening the hive. By understanding the frequency and strength of the DVAV signal in the hive, beekeepers and researchers might be better able to monitor the health of bee colonies worldwide. This "wake-up call" was not previously known to produce any vibration within the honeycomb, but we now have recorded the associated waveform in outstanding detail. Additional video analysis allowed us to confirm that it was the DVAV signal our sensor was detecting. From this, we were then able to create further machine-learning software to automatically detect and log any occurrence of DVAVs from the data our sensor picked up. Our new research builds upon the work done by Karl von Frisch who decoded the meaning of the honeybee "waggle dance". Von Frisch discovered honeybees use it to alert each other of nectar in the area, and it gives highly precise instructions on where to find it. The waggle dance is still discussed today as an example of astonishing sophistication in insect communication. The discovery also prompted a shift in our thinking about other life forms, and how they impact our lives. Beekeepers and researchers will welcome the unveiling of the small hive beetle's genome by Agricultural Research Service (ARS) scientists and their colleagues. The small hive beetle (SHB) is a major parasite problem of honey bees for which there are few effective treatments. The SHB (Aethina tumida Murray) genome—a genome is the sum total of all an organism's DNA; a gene codes for a single protein to be built—is available at is available at https://www.ncbi.nlm.nih.gov/genome/annotation_euk/Aethina_tumida/100 and was recently published in GigaScience. This information will provide crucial keys that should lead to better, more targeted SHB control methods, including insecticidal treatments and possibly even genetic/breeding solutions. The SHB has a strong gene-guided system that lets the beetle detoxify many insecticides. Having the genome will allow researchers to gain a more precise understanding of these detoxification genes, so more effective choices for control treatments can be made. "The big challenge is identifying control methods that will target SHBs but not harm honey bees," said geneticist Jay Evans, who ran the project and is also leader of the ARS Bee Research Laboratory. "One strategy is to look for insecticides that hit pathways in the genome where the SHB has few or no detoxification genes. It would be even better if an insecticide could be identified for which the honey bee has detoxification genes but that the SHB doesn't. A native of sub-Saharan Africa, the SHB has spread to many other locations, including North America, Europe, Australia, and the Philippines. 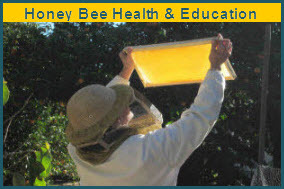 It was first found in the United States in 1996 and during the summer of 1998, the SHB was blamed for losses of more than 20,000 honey bee colonies in Florida alone. Today, the SHB has spread throughout the United States. It is a major problem especially for queen breeders and honey production. SHBs eat everything and anything in a bee colony: pollen, brood, honey, dead adult bees and combs) and cause honey to ferment in the process. If the number of SHBs is high enough, adult bees will abscond from the hive. One avenue to which the SHB genome has already pointed is where to look for clues for how the SHB finds beehives; what pheromones or other smells do SHBs follow to target honey bee colonies. Although there are about 350,000 beetle species and subspecies, only seven beetle genomes, including the SHB, have been completed and published. Completing the SHB genome takes on even more importance when you realize that among the SHB's close relatives are the destructive and invasive Asian longhorned beetle along with other sap beetles that are pests of sweet corn, tomatoes, strawberries and other fruit and vegetable crops. Scientists have found a striking diversity of bees, in the most extensive study of Grand Staircase-Escalante National Monument to date. AT FIRST GLANCE, it might not seem as if life thrives in the dry, otherworldly expanses of Grand Staircase-Escalante National Monument. The high, rugged patch in southern Utah is mostly known for its jagged cliffs, steep canyons, and vast, arid deserts. But bee biologist Olivia Messinger Carril knows better. For four years, she and a team of volunteers spent nearly every summer day combing the Delaware-sized area, bit by bit, in search of bees the untrained eye might miss. The main result: An awful lot of bees live there. Not just your ordinary yellow-and-black striped ones. There were iridescent blue mason bees, purple bees, green bees, and brilliant red bees. Bald bees, hairy bees, “big bumblers you can hear coming from a mile away, and tiny, tiny little ones that are the size of a comma in the books you’re reading,” says Carril, a science teacher at Santa Fe Girls School who does research on the side. All in all, a whopping 660 species live within the monument’s boundaries. That’s nearly every fifth bee species in North America. Forty-nine of these were entirely new to science, according to the recently published research. In December of last year, President Donald Trump issued a proclamation announcing his plans to shrink Utah’s Grand Staircase-Escalante National Monument to nearly half of its original size. Comprising a remote and beautiful stretch of canyons, cliffs and desert, the monument is home to a huge range of biodiversity, including hundreds of bee species. And some of those buzzing critters could be imperilled by the planned modifications, according to a new study. As Katarina Zimmer reports for National Geographic, research published last month in the journal PeerJ found that 660 bee species make their home in the Grand Staircase-Escalante, among them 49 species that are new to science. Over the course of four years, scientists catalogued black and yellow bees, red bees, turquoise bees, social bees, solitary bees, bees that nest in the ground, and bees that nest in cavities and twigs. It is not clear why so many bee species have chosen to make their home in the monument, but they may be attracted to the diversity of the landscape, which offers a range of habitats and desert plants. 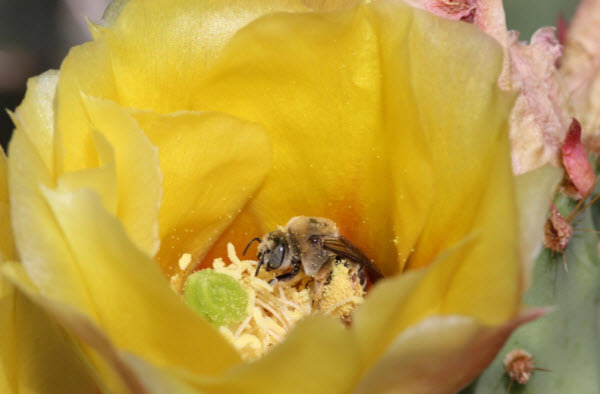 Most of the bees were found to dwell in geographically isolated locations, prompting the researchers to wonder how the administration’s proposed changes to Grand Staircase-Escalante will affect bee populations that live there. According to Emily Birnbaum of the Hill, the plan involves splitting the monument into three smaller ones, which could in turn open newly unprotected land to human development, like mining, road construction and natural gas extraction. As part of a follow-up study published this month, also in PeerJ, a number of the researchers involved in the first report studied the distribution of bees across old and new boundaries. They found that most of the bees—87 percent of the 660 species—live in areas that will continue to lie within the monument once its boundaries are reduced. But “that leaves about 84 species no longer inhabiting protected land,” says Joseph Wilson, an evolutionary ecologist at Utah State University and lead author of the new study. Some of these bees are unique “morphospecies,” or individuals that don’t match any known species, and others still have not been described. A number of newly excluded bee species also represent the northern or southern extent of their range in the region, which is important because “they can provide valuable information about how bee species might respond to climate change,” according to the study authors. 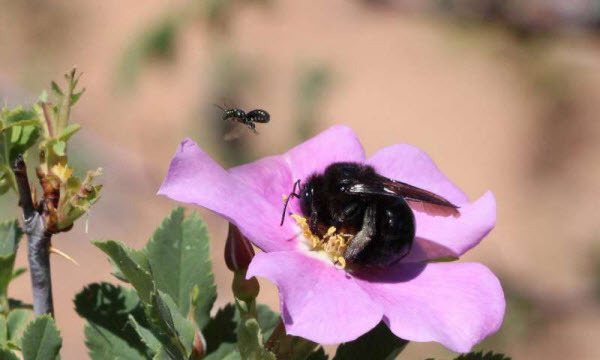 The researchers are also worried about possible threats to Grand Staircase-Escalante’s bees because, as pollinating insects, bees play a crucial role in their ecosystems. Indeed, the decline of honeybees across the globe, due largely to the use of bee-killing pesticides has sparked acute concerns about biodiversity loss and detrimental impacts on food production. Further study is needed, in other words, to fully assess the ramifications of the proclamation. It is not even clear if the proposed modifications will happen. Native American and conservation groups have filed lawsuits against the president, arguing that his plans to reduce the Grand Staircase-Escalante and another Utah monument, Bears Ears, are illegal and exceed the president’s authority. How the Hell Do You Vaccinate a Bee? Many and myriad a solution has been touted for the catastrophes reportedly afflicting bee colonies around the world, spurring fears that the loss of their pollinating powers will lead to massive crop losses. The latest wrinkle is to vaccinate the insects against diseases implicated in colony collapse disorder, a method (dubbed PrimeBEE) developed by two scientists in the University of Helsinki, Dalial Freitak and Heli Salmela, and reported by AFP and ZME Science. There is no consensus about the extent of the problem, or even whether bee colony collapse disorder is a thing, let alone a worsening thing. Some experts claim that declines in world bee populations is a natural fluctuation or that, in any case, it is reversible. The cause of the declining bee populations is variously ascribed to pesticides, geomagnetic disturbances (impairing the bees’ navigation), vampire-like mites, viruses, sunspots (navigation again), bacteria, fungi, climate change, and malnutrition. Or a combination of some or all of these. Some even claim that although there is a problem, its dimensions have been egregiously overstated. The one thing we’re sure of is that bees are good, certainly since we have abandoned a life of hunting and grubbing for roots in favor of industrial farming. Around a third of the plants people eat require pollination (grains don’t), and while fruit bats and other living beings play their part, bees are estimated to be responsible for about a third of that. No question, the insect is crucial to food security. So, whether or not colony collapse is a thing, clearly prevention is worth an ounce of honey. A riot of flower species are being planted or just allowed to grow between European crop fields, to vary the bees’ sources of nectar for the sake of their nutrition; in England, farmers have been planting hedgerows and trees because honey bees prefer them to “just” flowers. Scientists have experimented with fighting mite infestations by a method involving exposing the bees to cold (by, er, shutting them in the fridge), while others are monkeying around with rich solutions to augment their feed. Some people propose to replace the humbled honeybee with other more robust bee species, bats or whatever. (Robot bees don’t seem to be the answer.) And now Finnish scientists have invented the first-ever vaccines for bees. One gets a mental picture of a nimble-fingered scientist armed with an extremely fine needle and infinite patience. But one would be wrong. The inoculating chemical is put into a sugar cube that is fed to the queen bee, who passes the immunity onto her offspring. The scientists have begun their testing process with a sugar-coated vaccine against so-called “American foulbrood” – a fatal bacterial condition that actually affects bees around the world. Unhappily for our friends the bees, foulbrood is caused by sporulating bacteria, meaning hardy ones, and it’s highly infectious. It infects and kills bee larvae, not adults, hence the name. The bee vaccination technique will take some four to five years to perfect, lead researcher Freitak told AFP. Intriguingly, bee vaccination isn’t about injecting an antigen that provokes production of antibodies. Insect immune systems don’t have antibodies, but as the University of Helsinki explains, Freitak had noticed (in moths) that if the parents eat certain bacteria in their food, their offspring show elevated immune responses to that germ. Ultimately, this led to the thought of a delivery system of the vaccination via food. They started with foulbrood because it’s so deadly and infectious. Right now, the technique is being tested for safety, following which commercialization can ensue. Also, given that vaccinations do not cause autism in people (with all due respect to the lunatic fringe), there’s no reason to think they cause mental acuity or behavioral issues in bees. The easily administered edible vaccine could keep pollinators safe from bacterial diseases and give invaluable support for food production worldwide. Food and pollination services are important for everyone: humans, production animals and wildlife alike. Inventing something that guards against pollinator losses will have a tremendous impact. PrimeBEE is the first-ever vaccine for honey bees and other pollinators. It fights severe microbial diseases that can be detrimental to pollinator communities. The invention is the fruit of research carried out by two scientists in the University of Helsinki, Dalial Freitak and Heli Salmela. The basis of the innovation is quite simple. When the queen bee eats something with pathogens in it, the pathogen signature molecules are bound by vitellogenin. Vitellogenin then carries these signature molecules into the queen’s eggs, where they work as inducers for future immune responses. Before this, no-one had thought that insect vaccination could be possible at all. That is because the insect immune system, although rather similar to the mammalian system, lacks one of the central mechanisms for immunological memory – antibodies. "Now we've discovered the mechanism to show that you can actually vaccinate them. You can transfer a signal from one generation to another," researcher Dalial Freitak states. Dalial Freitak has been working with insects and the immune system throughout her career. Starting with moths, she noticed that if the parental generation is exposed to certain bacteria via their food, their offspring show elevated immune responses. "So they could actually convey something by eating. I just didn't know what the mechanism was. At the time, as I started my post-doc work in Helsinki, I met with Heli Salmela, who was working on honeybees and a protein called vitellogenin. I heard her talk and I was like: OK, I could make a bet that it is your protein that takes my signal from one generation to another. We started to collaborate, got funding from the Academy of Finland, and that was actually the beginning of PrimeBEE," Dalial Freitak explains. PrimeBEE's first aim is to develop a vaccine against American foulbrood, a bacterial disease caused by the spore-forming Paenibacillus larvae ssp. larvae. American foulbrood is the most widespread and destructive of the bee brood diseases. "We hope that we can also develop a vaccination against other infections, such as European foulbrood and fungal diseases. We have already started initial tests. The plan is to be able to vaccinate against any microbe". At the same time as the vaccine’s safety is being tested in the laboratory, the project is being accelerated towards launching a business. Sara Kangaspeska, Head of Innovation at Helsinki Innovation Services HIS, has been involved with the project right from the start. A big step forward was to apply for dedicated commercialisation funding from Business Finland, a process which is coordinated and supported by HIS. HIS assigns a case owner for each innovation or commercialisation project, who guides the project from A to Z and works hands-on with the researcher team. “HIS core activities are to identify and support commercialisation opportunities stemming from the University of Helsinki research. PrimeBEE is a great example of an innovation maturing towards a true commercial seed ready to be spun-out from the University soon. It has been inspiring and rewarding to work together with the researchers towards a common goal,” says Sara Kangaspeska. The latest news is that based on the PrimeBEE invention, a spinout company called Dalan Animal Health will be founded in the very near future. "We need to help honey bees, absolutely. Even improving their life a little would have a big effect on the global scale. Of course, the honeybees have many other problems as well: pesticides, habitat loss and so on, but diseases come hand in hand with these life-quality problems. If we can help honey bees to be healthier and if we can save even a small part of the bee population with this invention, I think we have done our good deed and saved the world a little bit," Dalial Freitak asserts. Honeybees are central for providing food for humans, production animals and wildlife by pollinating more than 80% of the plant species in the world. Recent years have witnessed a decline in pollinator numbers worldwide, threatening the food and fodder production. Among other reasons, emerging diseases are raging havoc in bee populations. PrimeBEE is the first-ever insect vaccine, which is based on the trans-generational immune priming mechanism, allowing immunological signals to be passed from queen bees to her offspring. PrimeBEE insect vaccine is easily administered as it can be added to the queen bee's food. The queen then conveys the disease resistance to its progeny. Tom Van Arsdall from the Pollinator Partnership (P2) has waded through the 807 pages of the Farm Bill now headed to the President’s office for signing. We asked P2 if the bill had any radical changes, good or bad, for pollinators in general compared to the bill passed 5 years ago. Here is the summary of their evaluation. o New Honey Bee and Pollinator Research Coordinator established in Office of the Chief Scientist. 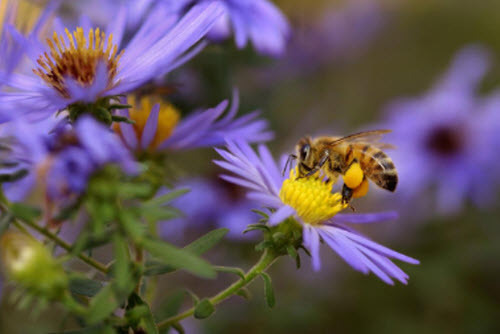 • Does NOT include major provision that was in the Senate-passed farm bill, which essentially would have codified in detail the Pollinator Health Task Force/Strategy implemented pursuant to the Presidential Memorandum on Honey Bee and Pollinator Health. o So at least the Presidential Memorandum, National Strategy on Honey Bee and Pollinator Health and the Pollinator Health Task Force remain in effect (no harm done). • There’s also language clarifying that beekeepers qualify for ELAP, and clarifying what constitutes covered losses. • While language in the Joint Statement of Managers doesn’t have force of law, it does provide clarification on legislative language decisions, plus intent of the conferees. This can be useful in advocacy efforts during implementation. o CRP cap will increase from 24 to 27 million acres. However, payment rates will be limited to 85% of rental rates, making CRP less attractive choice. o Conservation Stewardship Program (CSP), to continue, but at reduced funding. o Foundation for Food and Agriculture Research (FFAR), an additional $185 million provided (FFAR announced last spring $15 million in leveraged funds for pollinator research). P2 hasn’t had a chance to track down the specific sections of law referenced in the legislative language [sometimes just reference to sections being amended or deleted]. For example, according to news reports, reportedly no more cost-share assistance will be provided to growers for pollinator mixes for CRP (CP-42), largely due to excessive cost. Not able to confirm at this point. The No Added Sugar change was welcomed by the both the beekeeping and maple syrup industries, if not the FDA and AMS sections of the USDA. The new farm bill prevents maple syrup and honey producers from being required to list their pure products as containing added sugars on their nutrition labels — a plan proposed by the U.S. Food and Drug Administration months ago that producers said was misleading. After getting thousands of comments on the draft plan, the FDA acknowledged in June the labeling was confusing and said it would come up with an alternative approach for maple syrup and honey. “This was a huge mistake by the FDA so we got a common sense outcome to the pretty witless labeling requirement,” maple syrup producers said, echoed by beekeepers everywhere. The farm bill exempts “any single-ingredient sugar, honey, agave, or syrup” that is packaged and offered for sale as a single-ingredient food from bearing the declaration ‘includes X g Added Sugars” in the nutrition label. The FDA said in a written statement that it does not comment on pending legislation. It said it was drafting its final guidance, which it anticipates issuing by early next year.